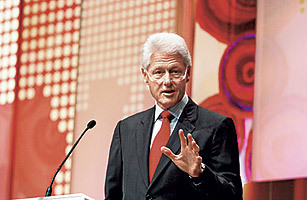 Leaders of business, government and society from all around the world journey to South Africa to discuss "the new global opportunity"
Former President Bill Clinton, Founder of the William J Clinton Foundation attends the TIME/FORTUNE/CNN Global Forum at the Cape Town International Convention Centre on June 27, 2010 in Cape Town, South Africa. The world always looks better when you wake up and find yourself in a drop-dead gorgeous place basking in glorious weather. So it was hardly surprising that the overwhelming sense of the crowd at the Global Forum hosted by TIME and our corporate cousins FORTUNE and CNN in Cape Town should have been one of optimism. In winter sunshine, underneath a Table Mountain that (most of the time) was without its habitual tablecloth of cloud, South Africa's Mother City looked magical, its people enjoying to the maximum the thrill of hosting games in the soccer World Cup. The theme of the conference was the New Global Opportunity. The phrase is not just a recognition that, as the world economy emerges from the Great Recession, there are markets aplenty in the developing world but also that, if we are wise, we will take the chance to build an economy that is more inclusive than before and more respectful of the need to conserve natural resources for future generations. That way, everyone will benefit. As former U.S. President Bill Clinton said in a keynote address to the forum, right now the world is "too unequal and too unsustainable to be stable." But it doesn't need to be like that. The question facing the more than 350 leaders of government, business and civil society assembled in Cape Town was how to help build a different world. The developed economies of the Atlantic region are seeing a fragile recovery at best, one with little growth in jobs  and even that slow growth is threatened, in the view of many economists, by the hair-shirted fiscal tightening that has been seen of late in Europe. Concomitantly with the forum, world leaders at the G-8 and G-20 summits in Canada were wrestling with the question of how long stimulus programs that have injected much-needed demand into economies could be continued. In that context, the performance of what we will soon have to stop calling the developing world has been tremendous. China grew by 8.7% in 2009, according to official figures. India showed excellent growth too, and even in Africa  so long dismissed by seers as an underperformer  growth hit 2% before the recession took hold, which followed years when the continent was growing at the historically robust rate of 6% or more. This isn't simply a function of the famous BRICs  Brazil, Russia, India and China  setting the pace. Indeed, as veteran global economist Kenneth Courtis of Themes Investment Management pointed out, Russia has fallen out of the club of most-favored developing economies, having been unable (so far) to use its endowment of natural resources to build truly world-class companies. With Indonesia increasingly catching the attention of business leaders, and Africa too, it might be time to try a new acronym: ABICI, for Africa, Brazil, India, China and Indonesia. Whatever you call them, the performance of the leading economies of the developing world has been sufficiently robust that political leaders like Rob Davies, South Africa's Minister for Trade and Industry, were able to trumpet the potential of south-south trade  while acknowledging that even the best-performing southern economies had been hurt by the continuing weakness in the rich world. The caveat is important, especially if, as Oxford University's Ian Goldin warned, there remains the real risk of a double-dip recession in the most-developed economies. Household-debt levels remain worryingly high, which is bound to dampen the recovery of consumer spending, and some banks still have substantial exposure to overvalued assets. But the worrywarts notwithstanding, corporate titans in Cape Town could hardly restrain their sense of excitement about the opportunities in the developing world. For AstraZeneca's CEO David Brennan, DuPont's chair and CEO Ellen Kullman and management consultancy McKinsey's global managing director Dominic Barton, the story of the recession was the acceleration of a trend toward growth in the developing world that had been under way before the downturn started. It isn't just that the developing world provides vibrant markets  84% of the world's population lives outside the combined area of the North Atlantic economies, Japan and the four original Asian dragons  that explains the new corporate focus. Increasingly, it is the potential for low-cost innovation in the poor world that can provide goods and services that can be sold everywhere. From telecom to banking to medical supplies, companies are finding business processes and products in the poor world that they can apply and sell everywhere. See Global Forum dispatches from FORTUNE.